I was 17 when I first came to Southwestern Adventist University. I remember that I was starting to learn how to use the webmail system in the school and all the things that you don’t really understand when you start college. I was surprised to read an announcement about a gospel choir hosting auditions. Growing up, I always wanted to join a gospel choir; for me, it’s one of those things that some people write in their Bucket List. Well this one was in mine. So I went to the auditions and I got in! It was one of the best moments in college for me. Joining the choir was one of the most amazing singing experiences that I have ever had. 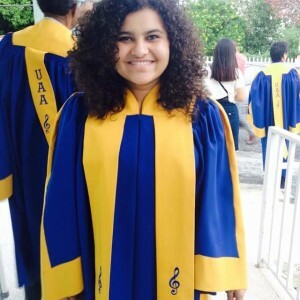 After I transferred to Puerto Rico for my second year of college, I got into the university choir. It was a good experience and it was really fun but I missed being at SWAU. During my time at Antillian University, they didn’t have a gospel choir and that was something that got me upset. I almost always try to join some kind of music group wherever I go. Here, my favorite singing group is the Gospel Choir because it’s a really fun genre of music to sing in. I really enjoy being able to sing my heart out as loud as I’m allowed to and I’m glad I am back this year. I’ve been in formal school choirs since I first started high school and I always sing with my family everywhere we go, even if it’s in a restaurant. Singing is one of my many passions and I love it. Thank you, SWAU, for this experience.